It`s time to Splash. A Special Announcement coming March 2nd. Looks to me like a rebranding of the water park (new logo?) or a bowl slide maybe (because that pulled back part of the post shows part of a circle). Well technically, they rebranded the pool area last year as Sunlite Adventure. (Which features Sunlite Pool, Twister water slide, Typhoon Tower, and Pipeline Plunge). Topic bump. They posted on their FB page today "Its time to ride." ^ How would that even work?! ^^ The problem with Pulsar is that it cost $9 million. It looks like a fun ride, but I would think Coney has better ways to spend that much money. Themed log flume or a modern Lake water ride chute the chutes lost river? Maybe a big water slide with tubes? Time to ride implies not a body slide. A family water ride would rock..Name it Lost River. the park on the banks of Ohio...that just rolls with it in the Rollercoaster Coaster of life.. Seriously, though, we need one of those in the US; just look how efficient that turntable is. And, it's like an impulse coaster and a huge water ride (like Congo Falls) all in one. This should be given to a park that doesn't have a big water ride, but also needs/wants a coaster. Seems Coney Island is jumping on the logo change bandwagon--and in my opinion, it is a downgraded logo. I do, however, like the brown circular portion that helps envision an island. Here is the link they provided to the concept art. 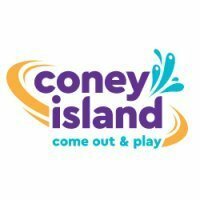 Coney Island is thrilled to announce our NEW brand/logo- Come Out and Play. This new logo encompasses who we are as a company and brand. Everyday, we inspire the spirit of play. We are also excited to announce that the pool area is being completely re-done and re-named to Sunlite Water Adventure. The renovation includes a new bath house, fully stocked tiki bar, island decor, new themed entrance and private entrance for season passholders. Check out our concepts that will be in full effect Memorial Day weekend. Yikes. Not a big fan of the logo or name "upgrade." Very "meh" about the other imporovrments as well. 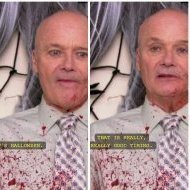 It just seems kind of off to me. I can't really put my finger on it. Typhoon tower change, I'm not too keen about. That attraction isnt old; the change just makes me think "look at us, we have a new logo!" The old script logo has been in use since the late 70s, so it is definitely time for an upgrade. I am not sure how I feel about the logo. I liked the new logo that was somewhat rolled out last year (see my avatar). I do not like the fact that the C and I are not capitalized, but I realize that is the in thing with logos. I get where they are coming from naming the pool area as Sunlite Water Adventures. The pool is called Sunlite Pool, but they really didn`t have a name for the water area, which includes Typhoon Tower, Pipeline Plung and the Twister water slides. Kind of marketing it as a water park. I like the theme they are going with too. I have known for a while that the bath house was going to be renovated. They could certainly use some freshening up. They last had a major renovation way back in 1991, 26 years ago. So they are definitely due for an upgrade. The tiki head on Typhoon Tower was actually removed before the end of the season last year. I like how the new look on the tower will tie into the theme in the rest of the mark. I think they may have overhyped this a bit. Hopefully the rides side will see some additions in future years. (They are repainting the Airplane and Helicopters kiddy rides, which look absolutely stunning, both of which are/were painted in house by one of Coney`s ride mechanics, who also painted the turtle parade, and Frog Hopper rides the last couple of seasons). I am still hoping they get a new wooden coaster one day, but not sure when or if that will happen. I am excited for this season at Coney. This will be my 16th season working at Coney. Hopefully I will see some of you out there. I liked the announcement, it went well. I like the theme Sunlite Water Adventures, it goes together good and nice to market with. I wish the new logo had a ride behind it like CoastersRZ one has, its more exciting and feeling of fun. Yeah, I agree, a little overhyped for leading up to the announcement. They should've started the hype for the announcement a little closer to the announcement date.. or went with a less implying slogan like "Things are getting brighter" or "Coney has it, but IT is getting better"
The splash thing made it sound like a new slide or some new attraction incorporating water. I like how in the Press Release it says: "This new brand strategy will set the stage for the growth and development of Coney Island over the next five years." Every park has a five year plan, right? Rest assured we will see future investments in the park, both on the rides side and the Sunlite Water Adventure. What I meant by my statement is that I like that they added it in there to show they are committed at least in the next 5 years to improving the park. I don`t know about a dark immersion Lost river ride coming to Coney in the future. If I were in charge of Coney, I have several rides that I would add to the park (besides the obvious coaster). A Chance train ride would be among the items added, as would a set of Flying Scooters.